Pack your sketchbook and join artists Tessa Pearson and Lara Harwood for a wonderful week of inspiration and creativity. 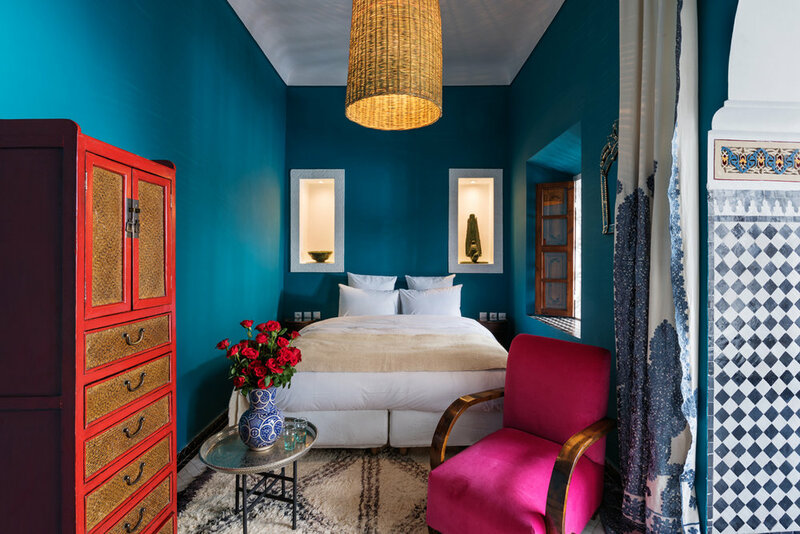 Riad Les Yeux Bleus - Marrakesh accommodation. A Drawing, Painting, Mixed Media and Printmaking Holiday. Explore the souks, draw & paint the gardens and palaces of the exotic city of Marrakesh. 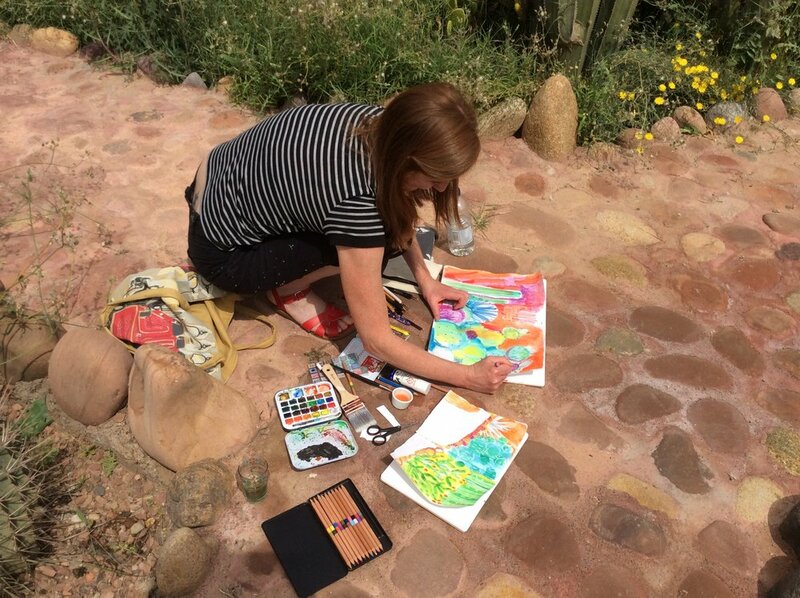 Experience the spectacular landscape and Berber Traditions in the High Atlas Mountains while experimenting with mixed media & printmaking. 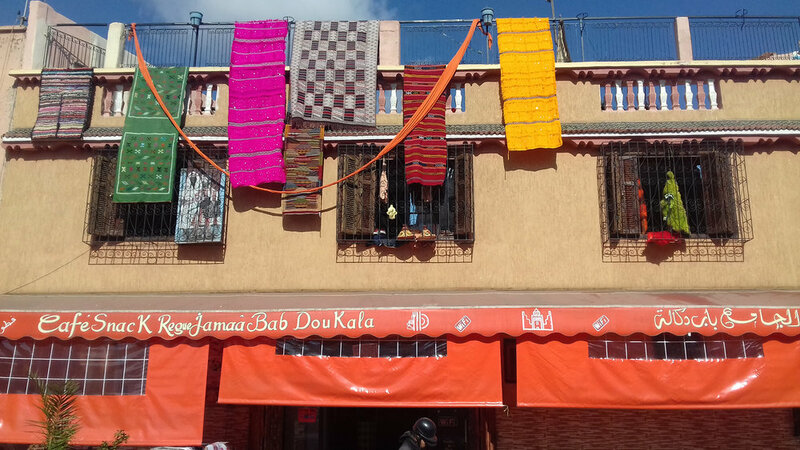 Staying three nights in a beautiful Riad Les Yeux Bleus in the old medina and four nights at the famous Kasbah du Toubkal. Lara and Tessa will share their favorite places, ideas and demonstrate their techniques with one to one tuition time. 7 nights / 8 day £1230 shared Room and limited single @ £1777 ) Price includes all meals, transfers, entry fees and some workshop materials. (Price does not include flights & insurance or Alcohol) Very Important ! You will need to book your own flights to arrive for the first day of the workshops.Transfers from Airport to Riad will be arranged etc once we have this info from you. Please let us know ASAP about your flight bookings. 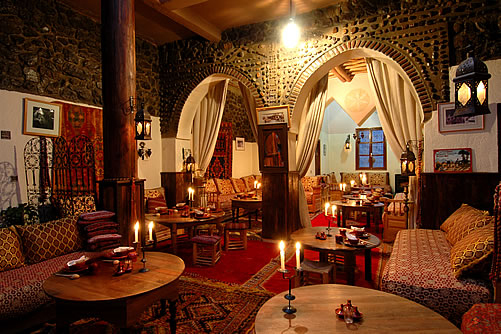 You will be met at the airport and escorted to the Riad accommodation in Marrakesh medina. If you arrive earlier in the day you will be able to relax on the Riad rooftop terraces, have lunch and maybe go out and explore a little. Later arrivals should be in time for evening drinks and an introductory talk by Tessa and Lara which will give you the opportunity to meet each other and we can discuss the following days arrangements. Dinner will be in the Riad. 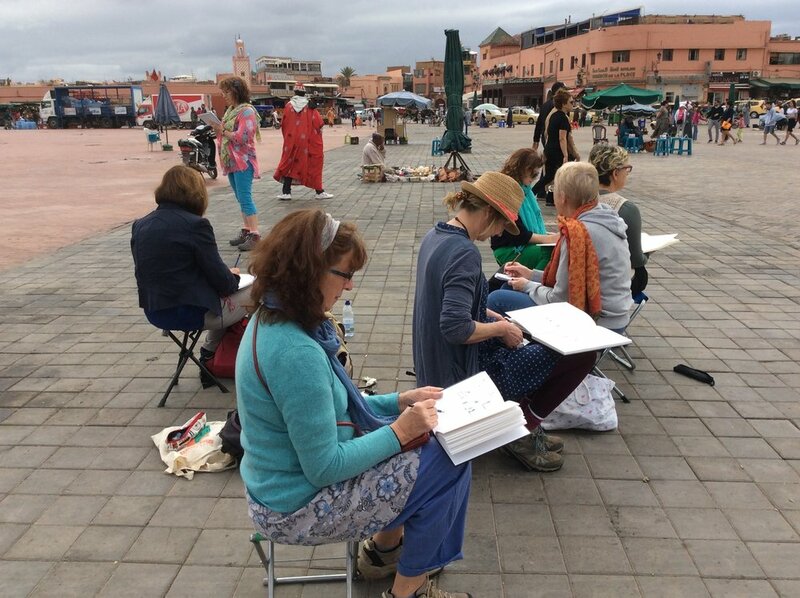 After breakfast you will be transported by private taxi to the Bahia Palace where Lara and Tessa will demonstrate their sketching techniques and accompany you in the Palace to draw and explore. A short walk away we will have lunch at the Henna Café followed by a walk up to the main square and back to the Riad, through the souk. 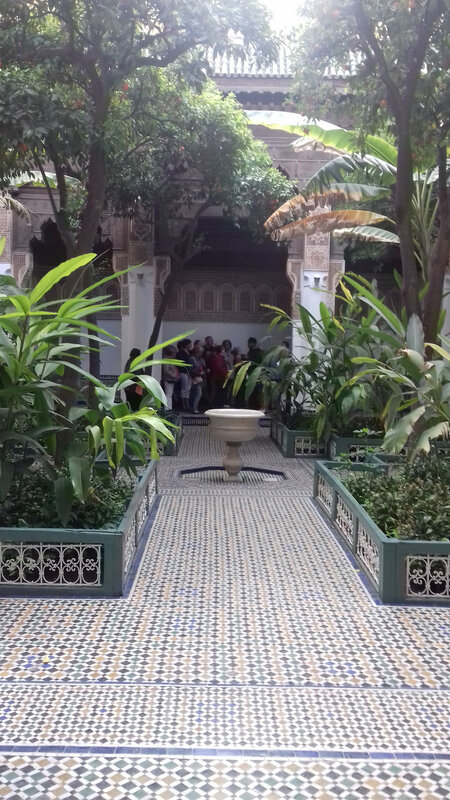 For those of you who like gardens there will also be the opportunity to visit the beautiful Jardin Secret in the medina. In the evening we have dinner at the Riad. 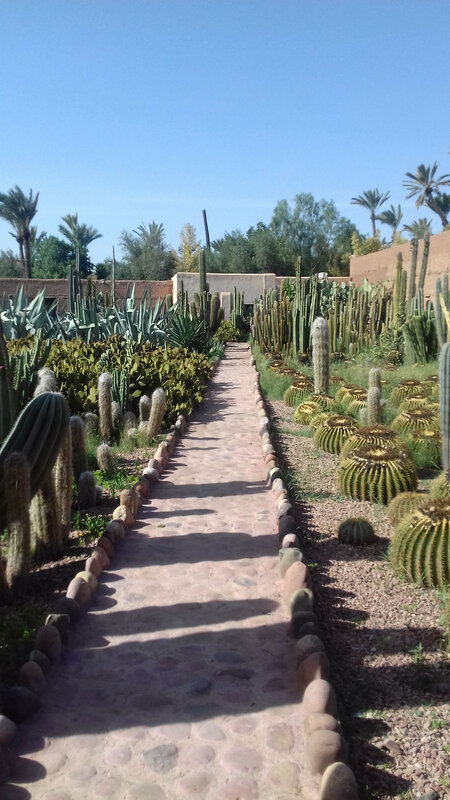 After breakfast we will go by private transport to the Musee de la Palmeraire, a gallery of contemporary Moroccan art with three wonderful gardens. 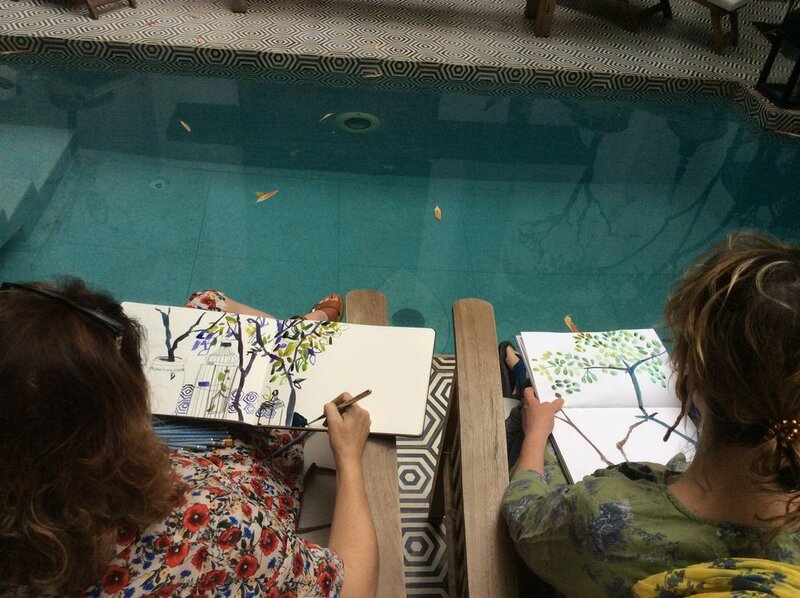 Lara and Tessa will demonstrate and advise, and you will have the morning to wander and sketch in the gardens or sit and soak up the atmosphere. We will then return by our transport to the Riad for lunch. 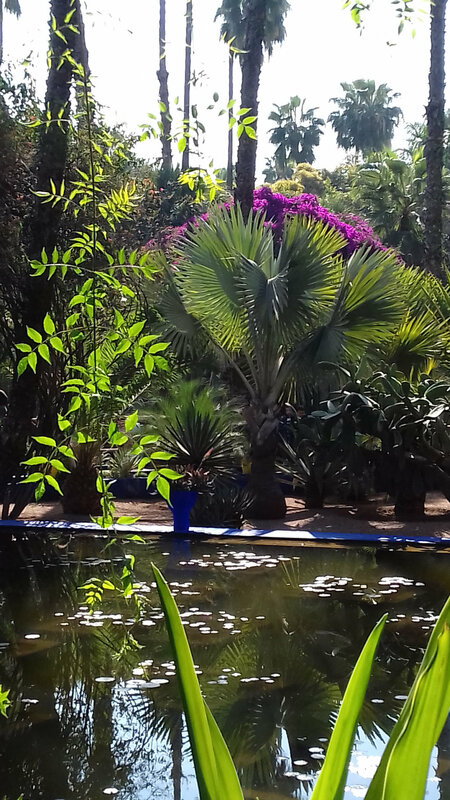 In the afternoon we will go by private transfer to visit the gorgeous Majorelle Gardens where you will be able to draw and photograph the exotic colourful garden. 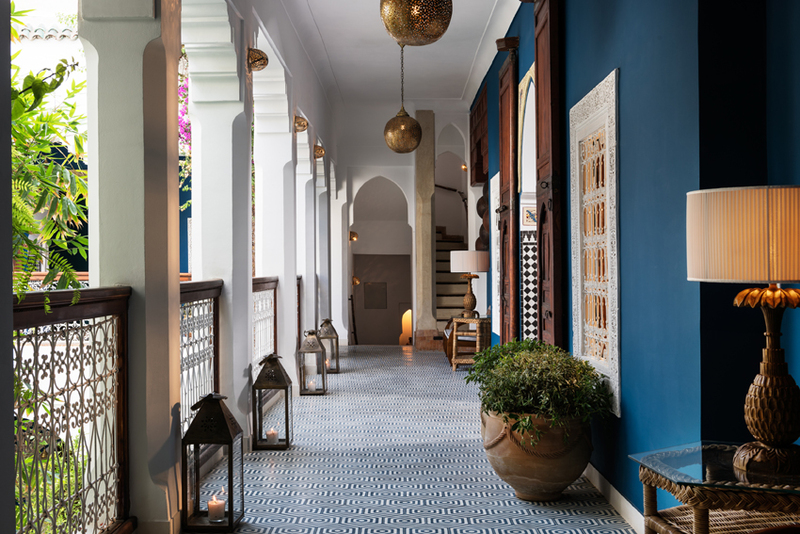 We will also visit the new Yves St Laurent museum next door and the Berber museum within the gardens (small entry fee) returning late afternoon to relax at the Riad. Pre-dinner show and tell Dinner will be at the Riad. 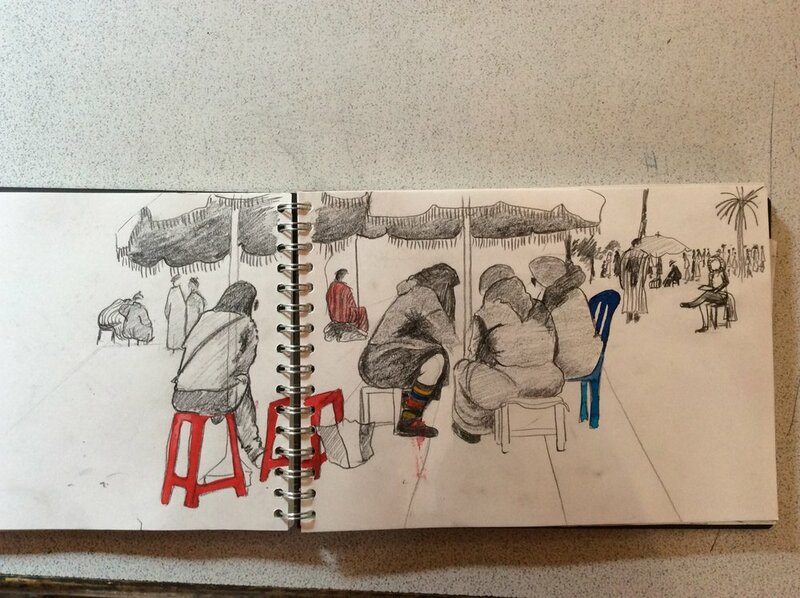 We will spend the morning in the place des Epices where Lara and Tessa will discuss and demonstrate techniques for capturing sketches of people and busy market scenes. You are then free to explore the square and draw with Tessa and Lara offering tips and encouragement. Return on foot to the Riad for lunch, after which we will depart for the High Atlas mountains and Kasbah du Toubkal at Imlil. (approximately 90 minute journey). 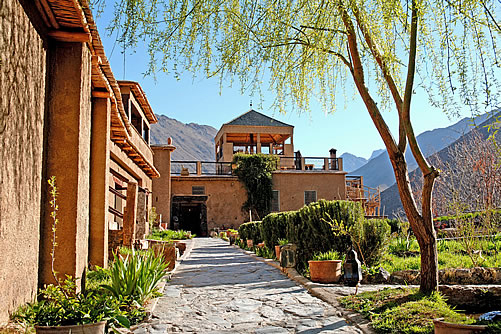 Arriving at Imlil, you will be met by a member of the Kasbah staff who will ensure your luggage is loaded onto a mule and you will be guided on a short 15-minute mule ride or walk up to the Kasbah. 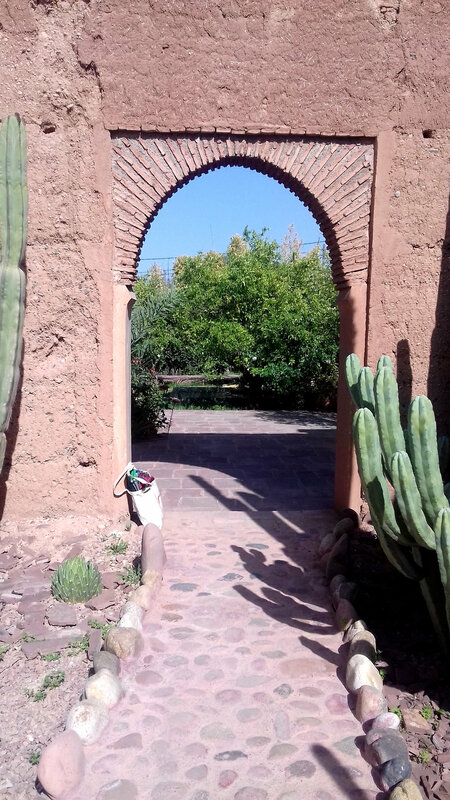 On arrival we will enjoy Berber tea and pastries, followed by a welcome talk about the Kasbah and time to relax. Dinner will be at the Kasbah. After breakfast we will take a guided walk up along the ancient paths and mule tracks, enjoying the spectacular views of landscape and on to the village of Arrempt,. Tessa and Lara will accompany you sketching. Lunch will be at the Kasbah, in the afternoon you will have demonstrations of mixed media and drawing techniques and time to develop sketchbook drawings in the studio. Pre-dinner show and tell. Dinner will be at the Kasbah. Dinner will be at the Kasbah. 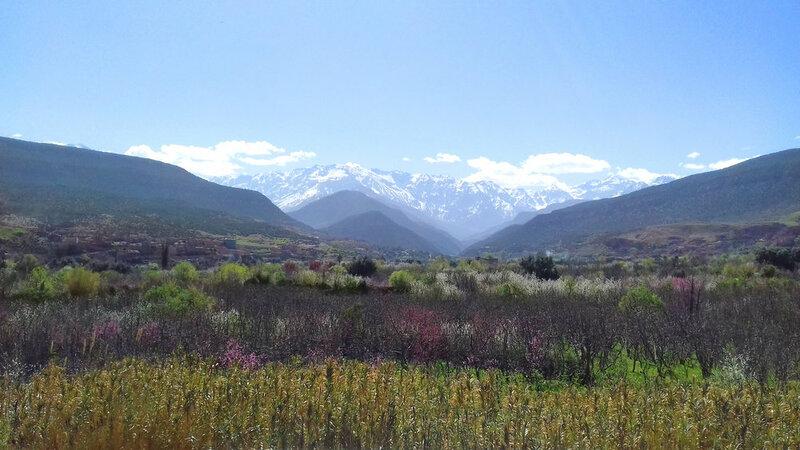 This morning we will walk down to the river valley below the Kasbah for sketching and painting. Lunch back at the Kasbah and in the afternoon you are free to explore the village shops and cafes or draw in the Kasbah gardens or out on the terraces. In the evening we will share our ideas and discuss the following days printmaking. Dinner will be at the Kasbah. 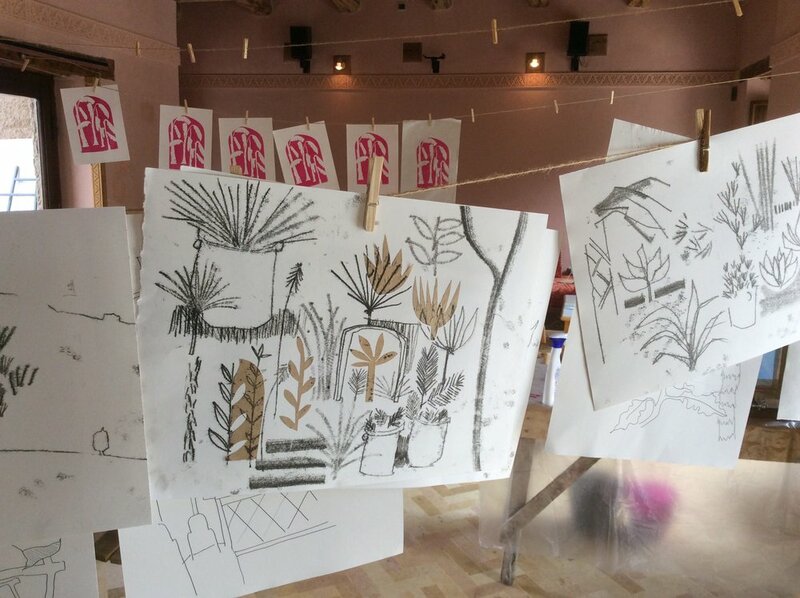 Today you will be based at the Kasbah, where Lara and Tessa will hold demonstration and small group taster workshops in screen printing and monoprint. 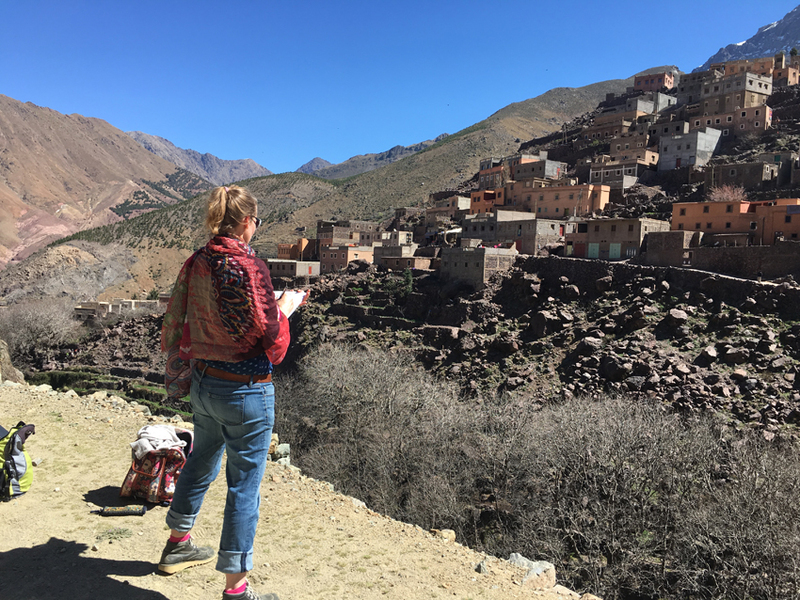 Lunch will be at the Kasbah, and in the evening we will have a small show of work to share with the Kasbah, and a traditional Berber feast for our last night. After an early breakfast you will be taken by private transfer back to Marrakesh airport for early flights. People with later flights can leave their luggage at an arranged Marrakesh hotel and spend the day in Marrakesh. "Using a sketch book is a wonderful way of being alive to a place and return with a book of treasures"